Provides students with a decision-making process for ethical issues. 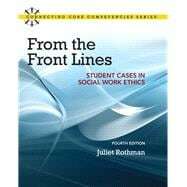 Now a part of the Core Competencies Series, From the Front Lines: Student Cases in Social Work Ethics, 4/e helps students develop a method of decision-making while providing examples with a number of case studies. Part One teaches readers the rationale for each part of the decision-making process and the tools needed to address it professionally. Part Two encompasses a thorough presentation and consideration of cases that address ethical dilemmas, issues, and problems which occur in social work practice. This text also encourages students to explore their own values and how they are used in everyday life as well as professionally. Connecting Core Competencies series -- Each chapter highlights the core competencies and practice behavior examples found in the Educational Policy and Accreditation Standards (EPAS) set by the Council on Social Work Education (CSWE). Critical thinking questions throughout reinforces these connections. Develop a method for decision making for ethical dilemmas, issues, and problems which occur in social work practice. Relate their decision making to real world examples. Dr. Rothman received her MSW from Hunter College (CUNY) and her PhD. (in philosophy) from American University in Washington DC. She specialized in ethics, focusing especially on professional ethics. She taught at National Catholic School of Social Service (CUA) in Washington DC. At UC Berkeley, she has taught social work practice, diversity-competent social work practice, social work with people with disabilities, death and bereavement, aging, and law and ethics in gerontology in the School of Social Welfare, aging, health and diversity in the School of Public Health, and interdisciplinary teams in the UCB/UCSF Medical School program. Her professional publications include: From the Front Lines: Student Cases in Social Work Ethics, The Self-Awareness Workbook for Social Workers, Contracting in Clinical Social Work, Stepping Out into the Field: A Field Work Manual for Social Work Students, Social Work Practice Across Disability, and Cultural Competence in Process and Practice: Building Bridges. She authored the Social Work Desk Reference’s article on Therapeutic Contracting with Clients. Recent journal articles include Teaching Spirituality: What We Can Teach and How We Can Teach It, and The Challenge of Disability and Access: Reconceptualizing the Role of the Medical Model. She is a member of the Advisory Board of the Journal of Religion and Spirituality in Social Work and the Journal of Social Work in Disability and Rehabilitation. In the field of bereavement, she has written a child’s bibliotherapy book, A Birthday Present for Daniel, and a book for bereaved parents, The Bereaved Parents’ Survival Guide. Dr. Rothman has worked in the field of long-term care with elderly and people with severe disabilities for many years. With the Multiple Sclerosis Society of Maryland, she has organized county-wide programs, worked with support groups, and provided individual counseling and therapy, as well as developing guidelines for social work practice with people with multiple sclerosis.